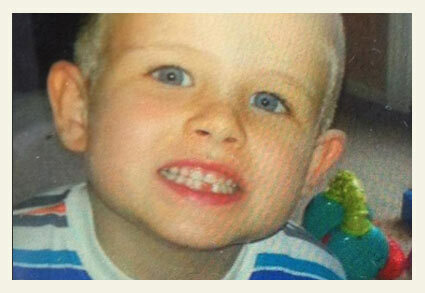 Ayden Evans, 5-years old, was killed by a bullmastiff while visiting a neighbor's home. UPDATE 06/13/13: The parents of a 5-year old boy mauled to death by a bullmastiff spoke out late Wednesday. Mica Evans, the boy's mother, said that her son Ayden Evans liked spaghetti and playing with Ninja Turtles. His mother said Ayden was staying with her sister for the summer, when he was allowed to go to a neighbor's home. That neighbor had a bullmastiff that attacked and killed her son. "I don't know the people he was with. Never met them. I don't want to," Evans said. The boy's family is from Oklahoma. After learning about his death, Ayden's parents drove from Oklahoma to Arkansas to bring their son back home. The boy's father, Greg Moore, said they still don't know the extent of their son's injuries. The funeral director told them that Ayden cannot be seen -- It has to be a closed casket funeral. The parents are still awaiting the autopsy report. They had their son cremated. A memorial service is being planned for Ayden in Oklahoma. His parents clarified reports about Ayden being in Oklahoma during the recent tornados. The boy's family was affected by the storms, but Ayden was not there. He went to Arkansas for summer vacation before the storms hit, Evans said. His mother also cleared up rumors about her sister taking custody of Ayden prior to the attack. She said that is just not true. Evans hopes charges are filed against the dog's owner. She added, "I am upset with everyone, including myself." Garland County authorities have still not released the name of the 5-year old boy killed by a dog on Sunday. The child suffered "major lacerations to the head and neck," according to a police report. New ownership information about the dog, however, has been revealed. Mary Bournival, one of the 13 Justices of the Peace for Garland County and heads the committee for animal control, said, "The Geilings were taking care of the dog for their son, who is serving overseas." "This is a situation where vulnerable people were unprepared and unable to ward off such a dangerous breed," she added. Bournival's committee has been discussing a new dog ordinance for months. The boy's death is a tragedy she feared would happen. "Our county does not have any regulations for dangerous dog breeds. All they need are rabies vaccinations. They don't need licenses, they don't need registration, they do not even need to be on a leash," Bournival said. Authorities in Garland County have located the bullmastiff that attacked and killed a 5-year old boy on Sunday.1 Authorities said the boy became upset and was crying. While a family friend was trying to calm him down, the dog came in from another room and attacked the boy -- it does not appear thus far the child was left unattended with the large animal. Details about how or why the dog fled after attacking the boy were not provided. The child's name has not been released. Over the last 12 hours, we learned that 50-year old Lynne Geiling of Jessieville owns the dog with her husband, according to Garland County Deputy Scott Hinojosa. Geiling told police she tried to pull the animal off the boy, but by the time she got them separated, the child had sustained serious injuries to his head and neck. The couple's dog, described as bullmastiff, allegedly ran away after the attack.2 As of late Sunday night, animal control was still searching for the attacking dog. Deputies said the boy and his 2-year old sister are from Moore, Oklahoma. The two children had been staying with the Jessieville couple for about two weeks while their parents try to rebuild -- their home was destroyed in the EF5 Moore tornado. "You can't imagine, you know, what this family and friends are going through right now," Hinojosa said. Geiling and her husband are described as family friends. Authorities continue to investigate; charges remain possible. Jessieville, AR - A Garland County Sheriff's Office spokesperson confirmed that a dog killed a 5-year old boy on Sunday. The child was bitten by a bullmastiff in Jessieville off Highway 298, according to deputies. The child was transported to Mercy Hospital in Hot Springs were he was pronounced dead. Tragically, the boy's family was in town staying with loved ones after their home was hit by one of the two EF5 tornadoes in Oklahoma last month. Updates are expected shortly. 1A separate article reported that Hot Springs Animal Control said the dog was killed by a resident on Monday. 2A "missing" family dog after a fatal dog attack is suspicious. Further, it appears no authorities have even seen the dog, calling into question whether the dog is a bullmastiff or not. The very people who likely offered the breed description, the dog's owners, are being investigated in connection to this boy's death. That of a symmetrical animal, showing great strength, endurance, and alertness; powerfully built but active. The foundation breeding was 60% Mastiff and 40% Bulldog. The breed was developed in England by gamekeepers for protection against poachers." The 40% bulldog doesn't mean the goofy looking Winston Churchill bulldog. It means 40% the original bear-baiting, bull-baiting, pit-fighting 'bulldog' that we now call the pit bull. Dogfighters still call their pit bulls simply 'bulldog'. All the 'bull' breeds were created by mixing this original pit bull with some other breed or breeds. Very often the fighting bulldog was mixed with some local mastiff type. This is what gave us the Bull Mastiff, the Presa Canario, Dogo Argentino, Boerboel, and so on. They are all in fact pit bull derivatives / mixes. So am I the only one who is wondering about the "missing" dog? Is the dog missing by accident or on purpose? If I was a betting person I would say the dog was conveniently missing. Last year when a babysitters "nanny" attacked the visiting child in Oxnard,CA, the dog also went conveniently missing. The boyfriend or brother ran off with it. It was later "captured". I see the dog was "found"
"Investigators were unable to locate the dog over the weekend, but found him Monday afternoon. The dog is expected to be euthanized. It's not known if the owners will be charged." Some of the comments on the news9 link (hyperlink Killer Dog Located) are incredibly disgusting. People are mourning the dog, stating the dog was just protective, and blaming the child. This child's bloody horrendous death will forever be hidden behind the smoke of TORNADO AND TEMPER TANTRUM. When I watch news coverage of weather or natural disasters like tornadoes or earthquakes I always wonder who is taking care of the monster dogs that can't be moved about so easy? It occurred to me that if a tornado had hit Jessieville AR and made a lot of unusual noise, would this Bullmastiff have killed its owners and whoever was around during the storm??? These people must have been friends and this dog must have been around these kids many times. Had they never made a high-pitched noise before? I am having trouble accepting how this dog owner says this all went down. 266th US DBRF in the last 8.5 years…That's an annual rate of just over 31 per year. The Dog lobby seems to be stuck back in the 90's claiming a number about half of what it currently is. i don't let my kids around strange dogs, i don't let strange kids approach my dog. some parents don't listen and let their children just walk up to him and i have to pull him away quickly because a kid could fall on him or poke him or just freak him out. luckily he's just a little guy and wouldn't do real damage. i can see why mom is angry with all involved, including herself. but if you're going to bring charges against dog's guardian, then why not against irresponsible aunt/sister, too.